Home » Blog » Blog » You Will Be Surprised to Know How Simple It Is to Achieve the Smile of Your Dreams! Show Off Your New Smile in Time for the Holidays!Your Guide to Whitening Your Smile at Home! For many people, the thought of going to the dentist can cause anxiety. Having a treatment done or hearing that their teeth aren’t in the best health is the last thing they want. When you visit our office, you’ll never believe how easy it is to have the smile you’ve always dreamed of having. If your teeth aren’t as aligned as you would like, the thought of having braces can be embarrassing, especially later on in life. They can be uncomfortable, difficult to maintain, and painful for your mouth. That’s why our Professional Invisalign is the perfect alternative treatment! Here are some of the benefits our Professional Invisalign treatment has over traditional braces. Appearance: Perhaps the biggest drawback of using braces is how they look. Having a mouth full of metal can make you feel more uncomfortable than if you left your teeth alone! You can end up wearing braces for years, so you want to make sure they look good. As the name suggests, our Professional Invisalign is completely transparent so no one can even tell you have them on, making them the perfect alternative to braces. Comfort: It’s no secret, traditional braces are uncomfortable to wear. All of the rubberbands and tightenings can put a strain on your mouth. However, Invisalign is much more comfortable to wear. They contain no metal, and your dentist will make sure it conforms to the shape of your mouth so they don’t feel out of place when you wear them so that you can feel good through the entire process! Food: Simple tasks such as eating become a hassle when you have metal braces. Food getting stuck in your teeth is a hassle that becomes a common occurrence with braces. Invisalign is removable and can be put back in your mouth similar to retainers, so that you can eat in peace! With this treatment, you won’t have to worry about missing out on eating some of your favorite foods. Safety: With traditional braces, you never know when a metal piece or wire could come loose and scratch the inside of your mouth. Invisalign is a single piece that doesn’t have any chance of harming the inside of your mouth. We believe a healthy smile should be made with comfort and care in mind. 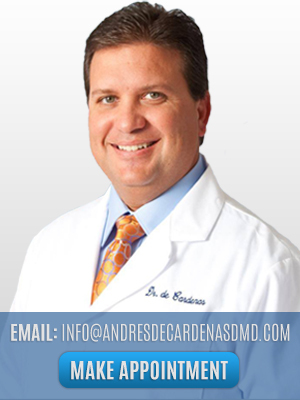 At the office of Dr. Andres de Cardenas, you’ll see just how easy it is to transform your smile with a Professional Invisalign treatment. If you’ve been hiding your smile for too long, it’s time to show it off again. With this treatment, you won’t stop showing off your beautiful teeth every chance you get! With decades of experience, our team will ensure you have the highest quality of care and treatments throughout all of your appointments. If you’ve had bad experiences at the dentist in the past, you’ll love visiting the dentist after you leave our office. Learn more about the benefits of Professional Invisalign by calling us today at 305-251-3334 or click here to schedule an appointment online!